In a somewhat hard-to-believe interview with the Chicago Tribune, Lampert gave many reasons for the company’s continued downward spiral. His claim: he is going to “...[turn] Sears into a 21st-century merchant focused on catering to its best customers.” It remains a mystery how that will be supported after selling off iconic brands, running the company without a seasoned merchant at the helm, and spinning off parts of the business that actually added value (Lands End). Yet Lampert seems to think he’s made great progress. In his own words, “We’re ahead of J.C. Penney, we’re ahead Macy’s, we’re ahead of Target in some aspects of where the world is going.” That would be true if where they’re all going is closing stores and selling off assets, but otherwise, it’s really hard to accept. Where’s the great product? Where’s the customer experience? Fellow analyst Cathy Hotka has repeatedly called the Sears Holdings situation “the world’s longest liquidation sale.” It’s very hard to disagree. It’s incomprehensible that one of the world’s largest retailers (No. 18 on Stores Magazine 2015 Top 100 Retailers list) is being run by someone with no retail experience whatsoever. Retail is an industry that plays an enormous part in the U.S. economy. Having been involved in it for my whole life, I can tell you that “Retail’s different.” If you focus solely on selling to your best customers, you might never get any new ones. The best retailers find ways to increase the transaction size (called “market basket” in the trade) and shopping frequency of their average customers. Looked at slightly differently, as a former boss of mine once said, it’s harder to turn an “A” store into an “A+” store. It’s a much better bet to move C’s to B’s and B’s to A’s. That’s a retailer’s challenge. Not catering to true believers. Recent times have taught us that some chief executives can make an effective transition from other industries into retail. Best Buy’s Hubert Joly comes to mind, as does Home Depot’s now retired Frank Blake. But they have to become students of the customer experience. And they must find ways to empower employees and excite customers. After six years of declining results, you might want to see if you can encourage shoppers to come back to your company, not milk the ones you think will never leave you. We owe a massive debt of gratitude to the pioneers of the fundamentalist movement. Sadly, few Christians understand the necessity of the war they fought in the last century. If not for their bold stand, the vast majority of American churches probably would have capitulated to the influence of theological liberalism—a juggernaut that spiritually devastated Europe, the heartland of the Reformation. The original fundamentalists were American theologians and pastors who understood that some biblical doctrines are too precious to take lightly. They resolutely defended foundational Christian truths like biblical inerrancy, the exclusivity of Christ, His resurrection, the realities of eternal life and eternal damnation, and human depravity. Those first fundamentalists prevailed through their unwavering commitment to God’s Word and refusal to negotiate on its truth. They are the reason why liberalism never overran the American church landscape, and why we can still find churches today where Scripture is supreme and the gospel is faithfully preached. Sadly, however, the fundamentalist movement began to unravel almost as soon as it had experienced its initial successes. One wing of fundamentalism, desperate for academic respectability, could not resist the pluralism of the modern age. Schools that had been founded to counter theological liberalism were overexposed to liberal theology and began to compromise on the issue of biblical inerrancy, capitulating at the very point where early fundamentalism had taken its strongest stand. Incredibly, some fundamentalist schools and churches abandoned their commitment to biblical inerrancy within one generation of their founding! Most of these institutions and the people associated with them quickly repudiated the designation fundamentalist. Another wing of fundamentalism moved the opposite direction. They were keenly aware that an obsession with academic respectability had led their brethren to abandon the fundamentals. For that reason they distrusted scholarship or spurned it altogether. This right wing of the fundamentalist movement was relentlessly fragmented by militant separatism. Legalism led to an extreme emphasis on external issues. Petty concerns often replaced serious doctrine as the matter for discussion and debate. This branch of the movement quickly reached the point where some of its adherents spent more time arguing about men’s hair length and women’s clothing than they spent defending the real fundamentals of the faith. All the squabbling and extreme legalism eventually sullied the term fundamentalism. Intellectually and temperamentally, these fundamentalists utterly abandoned the high ground that the fathers of the movement had held so tenaciously. As a consequence the movement succumbed to a subtle depreciation of doctrine. The published material from this side of fundamentalism is notable for its total lack of any significant works with real doctrinal or biblical depth. The term fundamentalist became exclusively linked with this militant group. In recent years, the term fundamentalist has been hijacked by the secular media, who apply it to every conceivable kind of religious fanatic. Comments: Top image (Church) source. 2nd image (Sears) source. 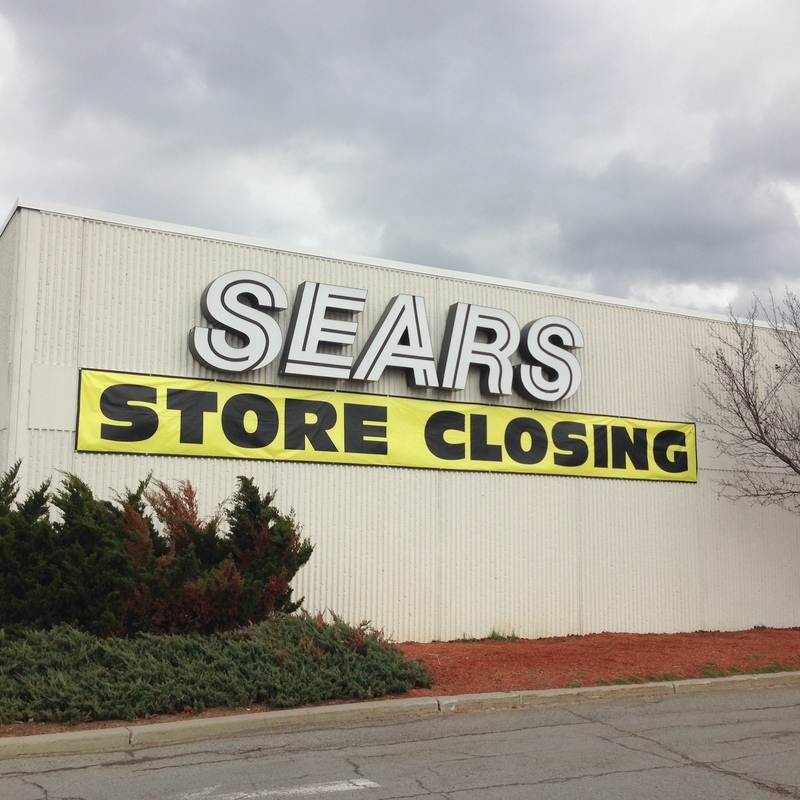 First the obvious: Sears is a retail store chain and fundamentalist churches are churches. In this they are not the same. Some might conclude that what they have in common is "shoppers" and shoppers have fickle tastes. This may be true but it's not the point I wish to make. They both were giants in America in their own rights. Sears was the place for appliances, clothing, tools and lawn equipment, auto repair and more. Fundamentalist churches were the bastion of Bible truth, evangelism and conservative worship. They both are a sullied brand. Proof: ask a millennial about his view of Sears. As for fundamentalism ... see this. Excursus: I used to equate the terms "Baptist" and "Fundamentalism" and perhaps at one point the terms were very closely associated. But in time the term "baptist" became diminished and churches became Fundamentalist churches associated with a fundamental lifestyle (perhaps learned at a Bible college and enforced by a student handbook and demerit system). Baptist principles such as the priesthood of the believer and individual soul liberty evaporated. The big "in common" is that just like Sears is looking to "sell [solely] to [its] best customers [instead of] get[ting] any new ones", fundamental churches are looking to gain disciples like them instead of winning new converts through aggressively taking the truth of the gospel to the neighbors next door. Example: Are you the Christian who has a beer now and then? You're not the disciple we want! 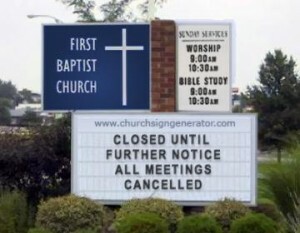 Fundamentalism with its associated "legalism led to an extreme emphasis on external issues"
Reality check for a fundamentalist church: If there are new members, what is their source: For many it's the children of existing members and some changing churches for some external issue that became debatable in their former church: musical style, et cetera. Jim - this makes so much sense it should be illegal . . . Seriously, well said. Have a great weekend! Investing with the "Dogs of the Dow"
IBM or Apple? Which would you buy and why? Are You in the Top One Percent of the World?